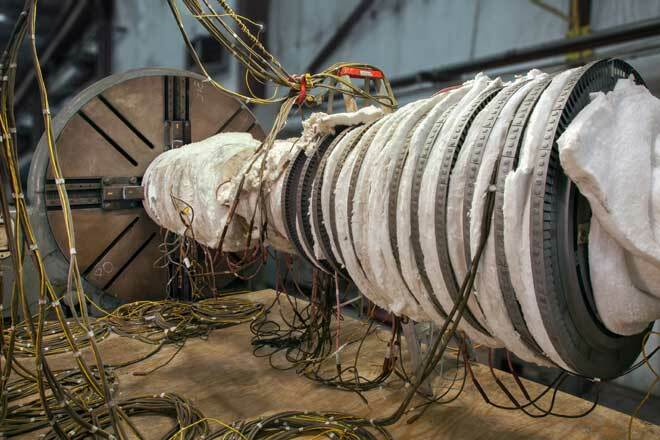 MD&A's Turbine-Generator Repair Facility provides a complete array of proprietary distortion correction services to straighten bowed steam turbine rotors. Rotor straightening services include and engineering analysis of root cause along with an initial assessment and recommendations based on experience and utilize computer modeling techniques. We offer stress relieving heat treatment and conduct thermal straightening using either vertical or horizontal methods. For most HP and HP/IP rotors, the Total Indicated Runout (TIR) should not exceed 0.007” (7 mils). At the customer’s request, we can use off set machining to correct for residual runout and design mating parts replacement and follow up site work. Case study of straightening an A-10 frame High Pressure rotor from 0.040” TIR to 0.003” TIR. Vertical Method- This method involves upending the shaft so it hangs or stands vertically. This method allows uniform heating with a minimum use of floor space. A lathe is not needed. Horizontal Method- The horizontal method involves setting the rotor in a lathe or similar turning device. The rotor is turned when needed to measure shaft straightening progress with dial indicators.